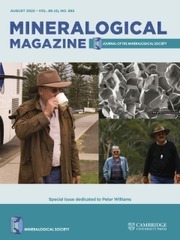 Mineralogical Magazine is an international journal of mineral sciences, published six times a year, which covers the fields of mineralogy, crystallography, geochemistry, petrology, environmental geology and economic geology. The journal has been published continuously since the founding of the Society in 1876 and is a leading journal in its field. As well as research papers the journal also includes book reviews.